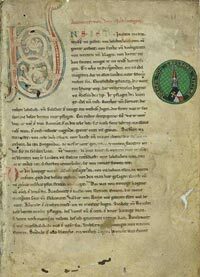 The Nibelungenlied, translated as The Song of the Nibelungs, is an epic poem in Middle High German. The story tells of dragon-slayer Siegfried at the court of the Burgundians, how he was murdered, and of his wife Kriemhild's revenge. 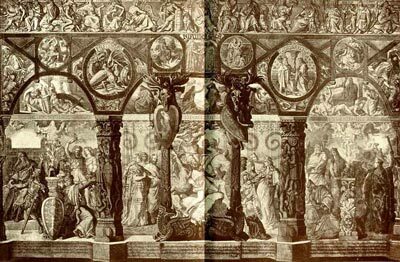 The Nibelungenlied is based on pre-Christian Germanic heroic motifs (the "Nibelungensaga"), which include oral traditions and reports based on historic events and individuals of the 5th and 6th centuries. Old Norse parallels of the legend survive in the Völsunga saga, the Prose Edda, the Poetic Edda, the Legend of Norna-Gest, and the Þiðrekssaga. Nibelungenlied – Shumway Translation - This 1909 translation by Daniel Bussier Shumway includes an Introductory Sketch and Notes. The story is presented in a prose format, though it appears to be a faithful translation of the words of the verse poem. Nibelungenlied – Cobb Translation - This 1906 translation by John Storer Cobb was published immediately after his death. An introductory note by his wife explains that he died before giving the transation a final revision, and that his Introduction to the book was compiled from some rough pencil notes he had written during the illness that led to his death. The story is presented in verse form. Nibelungenlied – Lettsom Translation - This 1901 translation by William Nanson Lettsom also presents the story in verse form, and the typesetting and page layouts are somewhat easier to read than the Cobb translation.